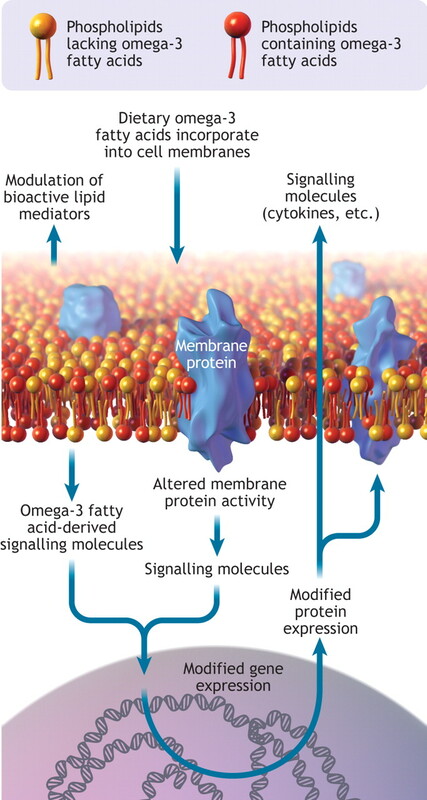 Following consumption, omega-3 fatty acids are incorporated into cell membranes in all tissues of the body (Figure 2). Whether the source of these omega-3 fatty acids is fish, fish-oil supplements or food products fortified with the appropriate omega-3 fatty acids, measurable changes in cellular membrane content occur within days of increasing the daily consumption of these fatty acids.5,6 Cellular membranes from some tissues (e.g, retina, brain, myocardium) are particularly enriched in these fatty acids. For example, about 30% of all fatty acids in the outer segment membrane of retinal photoreceptors are omega-3 fatty acids.7 The fact that these and other cells have developed the cellular machinery to preferentially incorporate these minor dietary components into their membranes suggests that these fatty acids play a role in the proper function of the cell. In fact, most cellular membranes accumulate omega-3 fatty acids in amounts that far outweigh their proportional content in the diet, and the content of these fatty acids in tissue membranes is generally indicative of our average daily intake. Diet-induced changes in the polyunsaturated fatty acid composition of a cell membrane have an impact on the cell's function, partly because these fatty acids represent a reservoir of molecules that perform important signaling or communication roles within and between cells. In particular, dietary omega-3 fatty acids compete with the omega-6 family of dietary polyunsaturated fatty acids for incorporation into all cell membranes.8,9 Arguably, the most important of all cellular polyunsaturated fatty acids is the omega-6 family member arachidonic acid. When cells are activated by external stimuli, arachidonic acid is released from cell membranes and is transformed into powerful cellular mediators such as thromboxanes, prostaglandins and leukotrienes.10 These compounds possess a range of activities, including activation of leukocytes and platelets, regulation of gastric secretions, induction of bronchoconstriction and signaling of pain in nerve cells. The importance of these compounds in health and disease is evident by the range of pharmaceutical products that target their biosynthesis or action.11 Indeed, arachidonic acid metabolism is the target of nonsteroidal anti-inflammatory drugs (e.g., acetylsalicylic acid, ibuprofen), cyclooxygenase-2 (COX-2) inhibitors (e.g., rofecoxib, celecoxib12) and leukotriene antagonists (e.g., montelukast, zafirlukast).13 Dietary omega-3 fatty acids directly affect arachidonic acid metabolism because they displace arachidonic acid from membranes and compete with arachidonic acid for the enzymes that catalyze the biosynthesis of thromboxanes, prostaglandins and leukotrienes.8 Thus, the net effect of consuming foods enriched in omega-3 fatty acids is a diminished potential for cells like monocytes, neutrophils and eosinophils to synthesize these powerful arachidonic acid–derived mediators of inflammation and a diminished potential for platelets to produce the prothrombotic agent thromboxane A2. Inflammation is part of the body's immediate response to infection or injury, but uncontrolled inflammation damages tissues. Indeed, uncontrolled inflammation plays an important role in the pathology of diseases such as asthma, rheumatoid arthritis and atherosclerosis. The ability of omega-3 fatty acids to interfere with arachidonic acid metabolism is at the heart of their proposed anti-inflammatory effects. However, enriching cells or tissues with omega-3 fatty acids also modulates the expression of adhesion proteins (Figure 2), such as selectins and vascular cell adhesion molecule-1, which participate in leukocyte–endothelium interactions.14 Omega-3 fatty acids exert this effect by modulating the intracellular signaling pathways associated with the control of transcription factors (e.g., nuclear factor-κB) and gene transcription.15,16 Omega-3 fatty acids can also directly bind to nuclear receptors, such as the retinoid X receptor, that operate as transcription factors.17 Similarly, the enrichment of monocyte membranes with omega-3 fatty acids results in the synthesis and secretion of reduced quantities of cytokines (e.g., tumour necrosis factor-α, interleukin-1β) that are involved in the amplification of the inflammatory response.16,18 Therefore, at the cellular level, omega-3 fatty acids from fish oils can directly or indirectly modulate a number of cellular activities associated with inflammation. It should be emphasized that these effects of omega-3 fatty acids should not be compared with the powerful ability of pharmacologic agents to inhibit individual targets, but rather viewed as a gentle shift in mediator production, cell signaling and gene expression toward a phenotype of lessened reactivity against environmental stimuli. Among people who consume typical Western diets, the average intake of the types of omega-3 fatty acids found in fish is about 150 mg per day. This is equivalent to consuming about 1 fish meal every 10 days.24 This falls well below the combined intake of dietary eicosapentaenoic and docosahexaenoic acids (650 mg/d) recommended at a workshop held in 1999 on essential fatty acids at the US National Institutes of Health.25 Similarly, the International Society for the Study of Fatty Acids and Lipids recommends an intake of at least 500 mg daily.26 The American Heart Association recommends that people without coronary heart disease have 2 fish meals each week (at least 300 mg of omega-3 fatty acids daily), and they recommend that patients with documented coronary heart disease receive 1000 mg daily.3 In addition, the US Food and Drug Administration recommends that the average daily intake of omega-3 fatty acids from fish should not exceed 3000 mg because of possible adverse effects related to glycemic control, increased bleeding tendencies and elevations in low-density lipoprotein cholesterol associated with very high intake of omega-3 fatty acids.27 Whether these concerns are warranted remains to be determined; however, it is not clear if these higher doses would provide additional health benefits. •	Omega-3 fatty acids are essential nutrients that cannot be synthesized in the body and must be obtained from the diet. •	Dietary omega-3 fatty acids are incorporated into cellular membranes of all tissues. The extent of incorporation into tissue membranes is dependent on dietary intake. •	The enrichment of membranes with omega-3 fatty acids can modulate cellular signalling events, membrane protein function and gene expression. •	Consumption of recommended intakes of omega-3 fatty acids may lead to a general increase in the overall health and well-being of the population. Acknowledgements: Marc Surette is supported by the Canadian Institutes for Health Research and the Canada Research Chairs Program. Lee KW, Lip GY. The role of omega-3 fatty acids in the secondary prevention of cardiovascular disease. QJM 2003;96:465-80. Whelan J, Rust C. Innovative dietary sources of n-3 fatty acids. Annu Rev Nutr 2006;26:75-103. Kris-Etherton PM, Harris WS, Appel LJ. Fish consumption, fish oil, omega-3 fatty acids, and cardiovascular disease. Circulation 2002;106:2747-57. Taber L, Chiu CH, Whelan J. Assessment of the arachidonic acid content in foods commonly consumed in the American diet. Lipids 1998;33:1151-7. Zuijdgeest-van Leeuwen SD, Dagnelie PC, Rietveld T, et al. Incorporation and washout of orally administered n-3 fatty acid ethyl esters in different plasma lipid fractions. Br J Nutr 1999;82:481-8. Surette ME, Koumenis IL, Edens MB, et al. Inhibition of leukotriene synthesis, pharmacokinetics, and tolerability of a novel dietary fatty acid formulation in healthy adult subjects. Clin Ther 2003;25:948-71. Bazan HE, Bazan NG, Feeney-Burns L, et al. Lipids in human lipofuscin-enriched subcellular fractions of 2 age populations. Comparison with rod outer segments and neural retina. Invest Ophthalmol Vis Sci 1990;31:1433-43. Calder PC. n-3 polyunsaturated fatty acids, inflammation and inflammatory diseases. Am J Clin Nutr 2006;83:1505S-19S. Healy DA, Wallace FA, Miles EA, et al. Effect of low-to-moderate amounts of dietary fish oil on neutrophil lipid composition and function. Lipids 2000;35:763-8. Funk CD. Prostaglandins and leukotrienes: advances in eicosanoid biology. Science 2001;294:1871-5. Celotti F, Durand T. The metabolic effects of inhibitors of 5-lipoxygenase and of cyclooxygenase 1 and 2 are an advancement in the efficacy and safety of anti-inflammatory therapy. Prostaglandins Other Lipid Mediat 2003;71:147-62. Loewen PS. Review of the selective COX-2 inhibitors celecoxib and rofecoxib: focus on clinical aspects. CJEM 2002;4:268-75. Riccioni G, Bucciarelli T, Mancini B, et al. Antileukotriene drugs: clinical application, effectiveness and safety. Curr Med Chem 2007;14:1966-77. De Caterina R, Massaro M. Omega-3 fatty acids and the regulation of expression of endothelial pro-atherogenic and pro-inflammatory genes. J Membr Biol 2005;206:103-16. Weber C, Erl W, Pietsch A, et al. Docosahexaenoic acid selectively attenuates induction of vascular cell adhesion molecule-1 and subsequent monocytic cell adhesion to human endothelial cells stimulated by tumor necrosis factor-alpha. Arterioscler Thromb Vasc Biol 1995;15:622-8. Novak TE, Babcock TA, Jho DH, et al. NF-kappa B inhibition by omega-3 fatty acids modulates LPS-stimulated macrophage TNF-alpha transcription. Am J Physiol Lung Cell Mol Physiol 2003;284:L84-9. de Urquiza AM, Liu S, Sjoberg M, et al. Docosahexaenoic acid, a ligand for the retinoid X receptor in mouse brain. Science 2000;290:2140-4. Caughey GE, Mantzioris E, Gibson RA, et al. The effect on human tumor necrosis factor alpha and interleukin 1 beta production of diets enriched in n-3 fatty acids from vegetable oil or fish oil. Am J Clin Nutr 1996;63:116-22. Jeffrey BG, Weisinger HS, Neuringer M, et al. The role of docosahexaenoic acid in retinal function. Lipids 2001;36:859-71. Xiao YF, Sigg DC, Leaf A. The antiarrhythmic effect of n-3 polyunsaturated fatty acids: modulation of cardiac ion channels as a potential mechanism. J Membr Biol 2005;206:141-54. Marchioli R, Barzi F, Bomba E, et al. Early protection against sudden death by n-3 polyunsaturated fatty acids after myocardial infarction: time-course analysis of the results of the Gruppo Italiano per lo Studio della Sopravvivenza nell'Infarto Miocardico (GISSI)-Prevenzione. Circulation 2002;105:1897-903. Siscovick DS, Lemaitre RN, Mozaffarian D. The fish story: a diet-heart hypothesis with clinical implications: n-3 polyunsaturated fatty acids, myocardial vulnerability and sudden death. Circulation 2003;107:2632-4. Kris-Etherton PM, Taylor DS, Yu-Poth S, et al. Polyunsaturated fatty acids in the food chain in the United States. Am J Clin Nutr 2000;71:179S-88S. 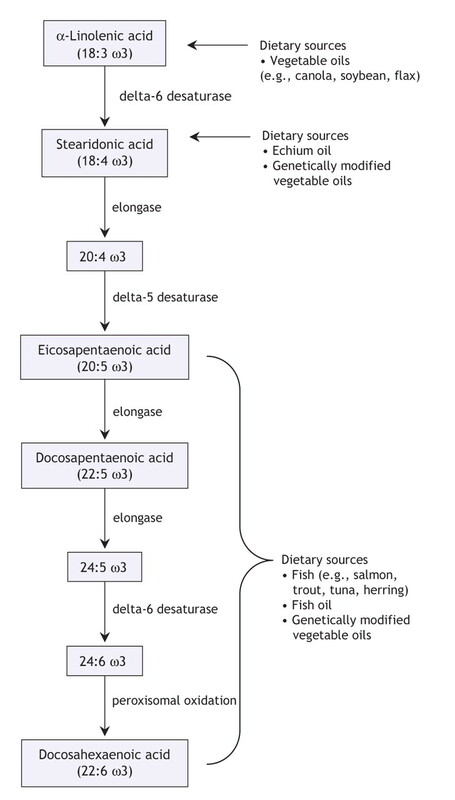 Simopoulos AP, Leaf A, Salem N Jr. Essentiality of and recommended dietary intakes for omega-6 and omega-3 fatty acids. Ann Nutr Metab 1999;43:127-30. Cunnane S, Drevon CA, Harris W, et al. Recommendations for intakes of polyunsaturated fatty acids in healthy adults. ISSFAL Newsl 2004;11:12-25. Department of Health and Human Services. US Food and Drug Administration. Substances affirmed as generally recognized as safe: menhaden oil. Washington: Federal Register; 1997. 1997;62:30751–7 (21 CFR Part 184 [Docket No. 86G-0289]). Available: http://frwebgate.access.gpo.gov/cgi-bin/getdoc.cgi?dbname=1997_register&docid=fr05jn97-5 (accessed 2007 Nov 26). Surette ME, Edens M, Chilton FH, et al. Dietary echium oil increases plasma and neutrophil long-chain (n-3) fatty acids and lowers serum triacylglycerols in hypertriglyceridemic humans. J Nutr 2004;134:1406-11. Should patients with cardiovascular disease take fish oil? Do vegetarians have to eat fish for optimal cardiovascular protection?